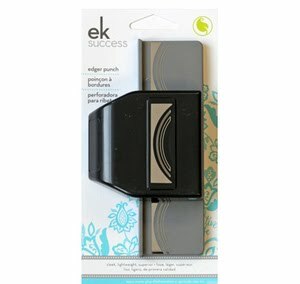 The EK Success Embossed Curve Slim Edger border punch is a relatively new punch on the market. Ok, probably not brand new, but in my search for a new and interesting border punch, this one jumped out at me at Michael's a month or so ago. 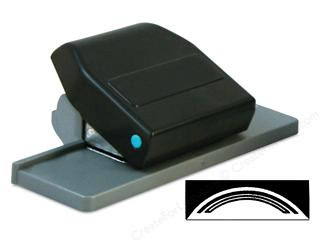 If you have not used a border punch before, let me tell you how easy they are to operate. The punches have a picture of the image on the top of the lever and on the base of the punch, which make them friendly. Start your paper at the start of the photo on the punch lever. Gently push the paper to the top edge, making sure the right side of the paper is perfectly against the rim. Slide your paper down, so that your newly punched image lines up with the picture on the punch base. Making sure the right hand side of your paper is against the top rim, punch again. Continue until you have completed your pattern. This is a view of the punch in its open state. I think that is one of my favorite features of the Slim Edgers; they close flat for storage. On the back of each punch is a small tab that you push one way to open the punch. To close it, you press the punch down and slide the tab back to its original place. One issue I have with the punch, and it may just be mine, is thinner papers seem to get stuck inside the punch. When you put paper through the punch, it leaves a small piece on the top, as a guide, so your pattern continues flawlessly. I found that my thinner patterned paper got stuck in the top corner of the punch. Somtimes it took a bit of force to dislodge it. Thicker cardstocks, such as Papertrey Ink (110 lbs), did not seem to have this issue. 1. Thinner papers seem to get stuck. 2. A smaller curve set to fit the size of cards would be great. But, I understand the need to have it appeal to card makers and scrapbookers. 2. The way the punch can be closed for storage. 3. How easy it is to line up the pattern for a perfect border. 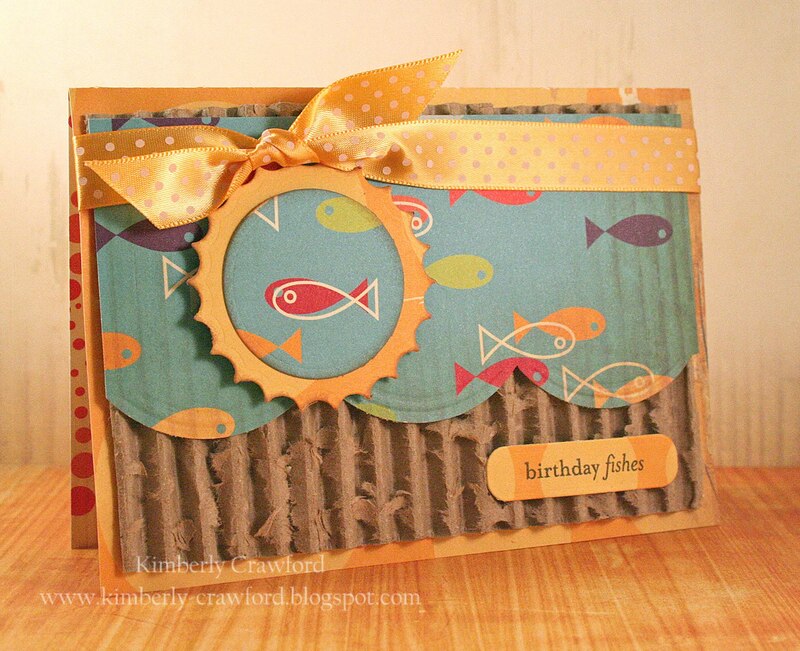 For this card, I punched several layers of borders and stacked them on the card. I thought the punch looked like the negative of a wave, which worked perfectly with the fish papers and the silly sentiment. Another nice feature of this punch, is its embossed portion. If you look at the photo of the punch, you can see the small half circle image that is raised. It sanded off easily on this card, especially with the Core'dinations cardstock, meant for that look. I did want to point out the size of each of my cards. These last two were 6 inches long. I did that because the punch pattern seemed to fit that size better. I did run the punch down an entire length of 12x12 cardstock. The pattern had one curve that was about one-third complete. Being overly concerned about that kind of thing :) (ok Type-A), I would start the pattern differently at the top. But, the punch easily lets you do those kinds of things. Available at: Creative Scrapbook Store, Scrapbooking Warehouse *, Frantic Stamper Inc.
Do you like this punch? Do you like border punches? How often do you use them? Which is your favorite brand and why? Have you found some punches work better for scrapbooks than cards and vice versa? Share your wisdom! I love your examples you made - I'm not sure I would have thought to purchase this particular punch without seeing how it could be used. Thanks for the examples. I do have a different punch in this same line, and I love that it folds down for storage and that the design is easy to line up. I will definitely look for this curved one next time I'm out shopping. cool punch! love your cards kim! Great cards! Very cool punch...I agree, probably wouldn't have picked this punch up but now I see what it can do, very cool! Super cute cards Kim! That punch is now a must have! I really like the border punches from EK Success! There are so many great designs (I have a few of them) and I like how they store flattened. I do agree that thin papers are no good in this punch so if I need to punch something thin I adhere to a piece of cardstock and then punch it. I don't have that punch but I think I'd like it, though I haven't tried any of EK Success' border punches. I do have some of Fiskars and I love them but they do require a fair amount of pressure - to me, they are a standing up tool. I do scrapbook and make cards, but for me they're mostly for making cards, which is why I wish Fiskars step ones had smaller designs in 1/4" or 1/2" increments for cards. Those square cards are expensive to send! I love punches! My favorites are Martha Stewart and Stampin Up. I don't own this particular punch, but I have seen it used and it did catch alot of paper, even the thicker ones. I do have some of their other border punches and I absolutely love them! they are so easy to use, and to store as well. I do have alot of the fiskar and Martha Stewart border punches and love those as well, but they are harder to store and take along to crops. I think they should all go to the flatter design with a latch to keep them shut! On your "dislikes"-there are plenty of smaller scalloped punches-I am glad to see this one that has the larger scallops too! I LOVE all the punched like scallops that are so great for using over and over. I have all most of the "non-themed" border punches. And ALL the butterflies out there almost!! LOVE the punches!! I don't have a Cricut (there is one where I work)-and JUST got an Epic... I reach for punches now almost 80 of my layouts!! I can't say I have a favorite line but I just looked and of the 3 border punches I have, 2 are Fiskars. I like them but sometimes they are hard to line up just right. I have looked at the EK Success ones many times and that particular one you used ALOT but I didn't know how it would look punched out. It's awesome. It would be fabulous for scrapbook pages but I love the look on your cards. They are gorgeous. I think you just enabled, lol. I recently bought this border punch. I love the design and embossing. However, thin paper does get stuck and tears easily when using this punch. I've never had this problem with a border punch before and it has left me disappointed with EK success. I will stick to fiskars from now on. I have this punch and seldom use it. In fact, I have several of these punches. I love the way they store flat, that is what attracted me to them but I have a terrible time using them w/even regular cardstock. I prefer Fiskars and Martha Stewart brands. Agree with you 100%! 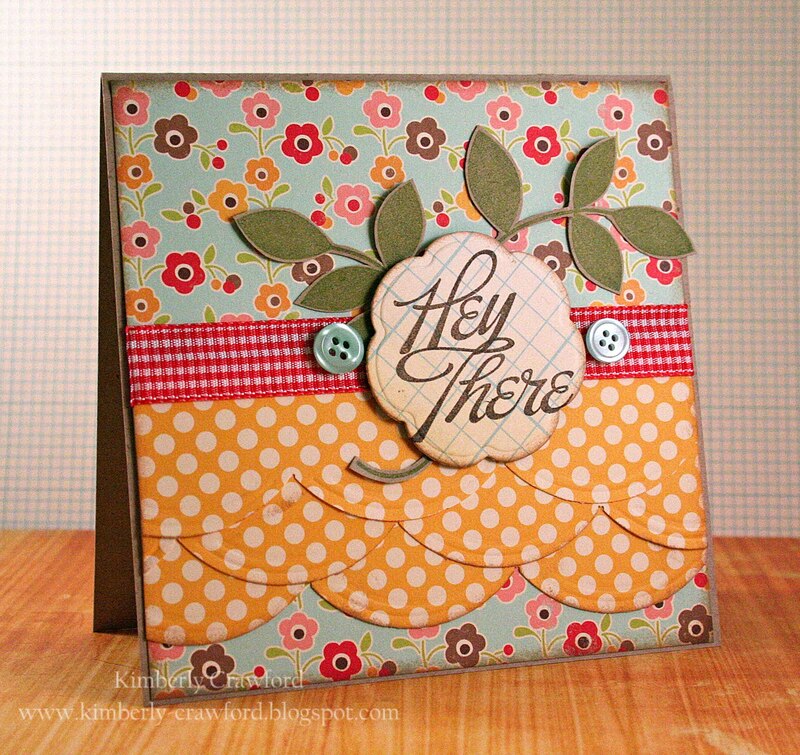 This punch is one of my favorite designs, but it doesn't work with designer paper!!!! Mine gets jammed every-single-time I use it and it drives me crazy. Was thinking about writing to them. Glad to know it's not just me. Works fine with regular cardstock, but since I work with designer paper, like, all-the-time, this punch is nothing but a huge frustration to me. Do you want me to tell you how I really feel, LOL??? Other than that, I love the design of the punch, just not the functionality of it. Such a bummer. 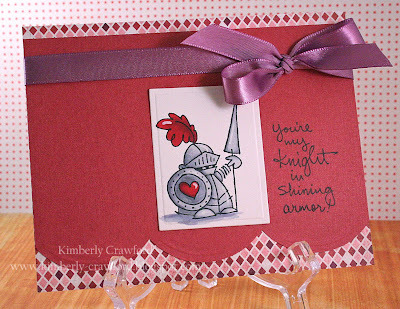 THanks for the great article Kim, and of course, the cards are fab! See, I love my border punches and so far had no problems with the Slim Line EK Success ones. Great review, I have this punch and really like it. I haven't used any thinner paper in it yet so can't weigh in on that part. Thanks Kim for this review. I purchased this punch because I saw so many great cards made with it. I did not think it would be one that I would use because the curves are so large, but once I used it I fell in love with the look. Also, I LOVE that EK is making their punches so that they lie flat once you are done! I had this exact punch and after opening it, it caught and tore the cardstock. I had a difficult time getting it out and returned the punch back to Michael's. The new one I tried only once and it seemed to do fine. Maybe I should go try it a few more time just to be sure. Thanks for the review. Great projects! Love that punch! I'll be on the lookout for that one!